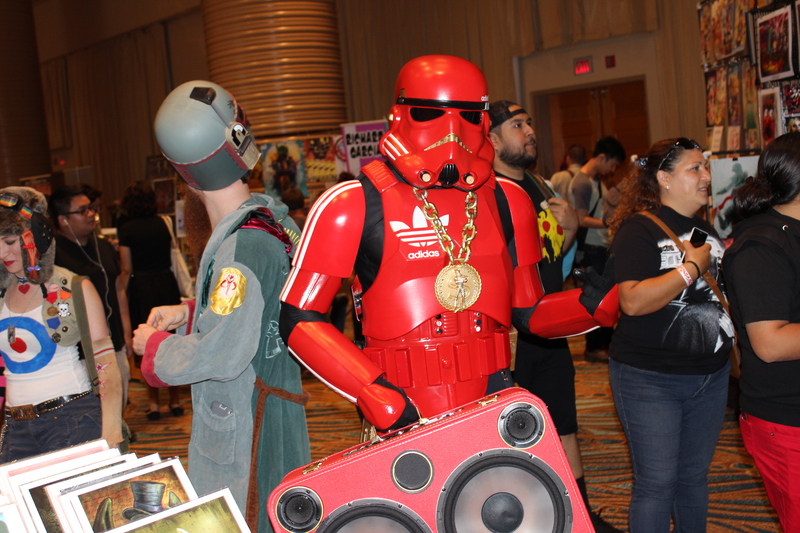 Yesterday, I attended the fifth annual Long Beach Comic Expo and, of course, was curious about which Star Wars stuff there was. 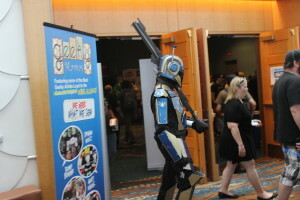 While there were no panels, there was certainly cosplay (see end of post) as well as some interesting art. 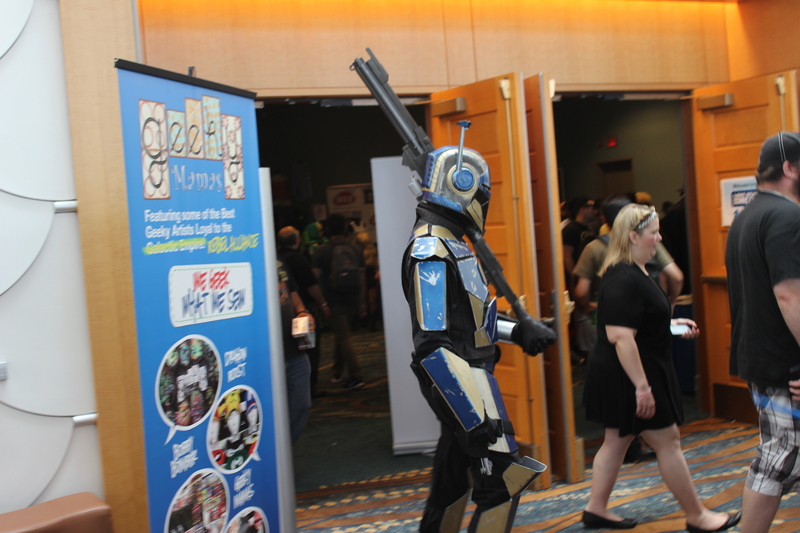 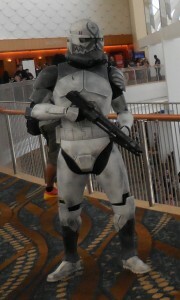 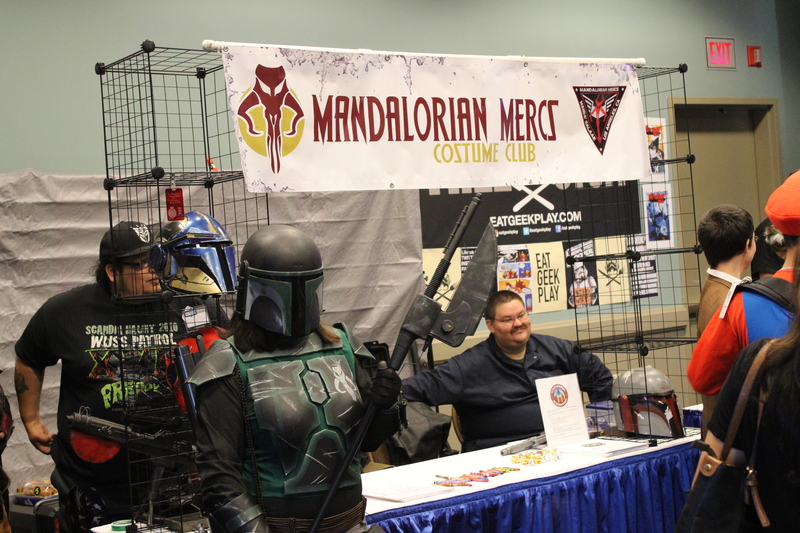 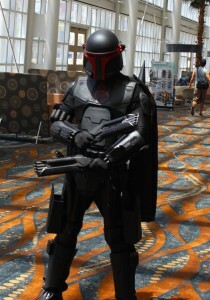 Additionally, there were two fan groups there: the 501st Legion and Mandalorian Mercs. 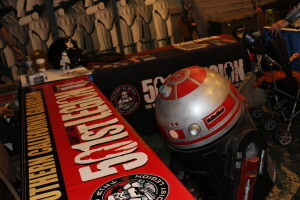 However, despite the massive table space that the 501st Legion had, they really were not representing. On the other hand, the Mandalorian Mercs definitely had a more significant and spirited presence. 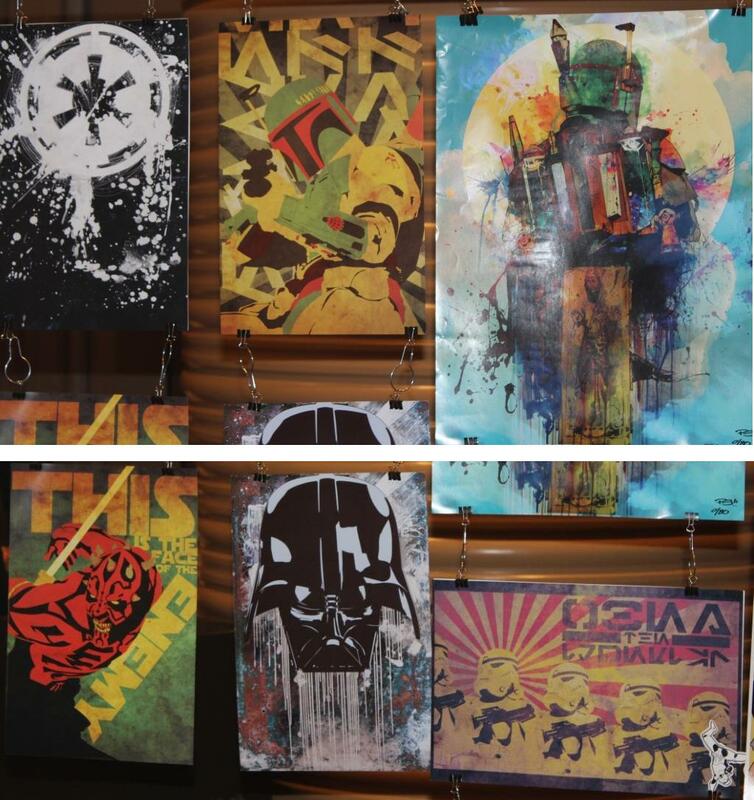 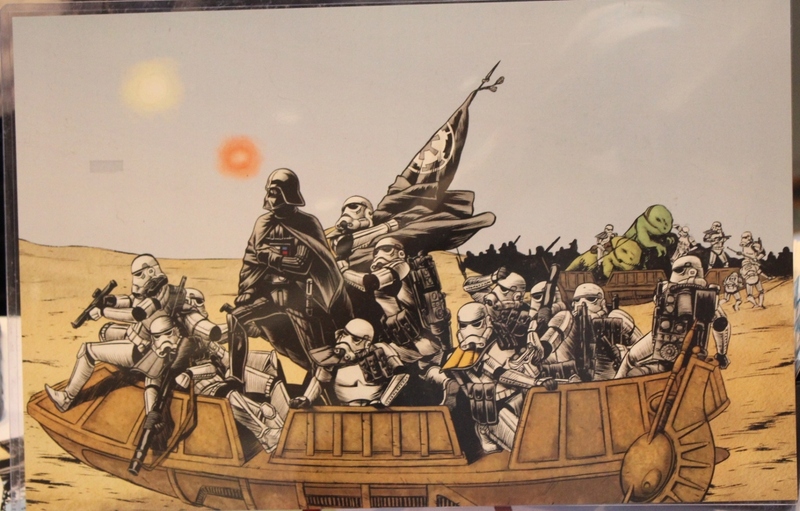 – Patty McPancakes had some interesting pieces, especially Boba Fett, as well as some interesting propagandistic pieces (see right). 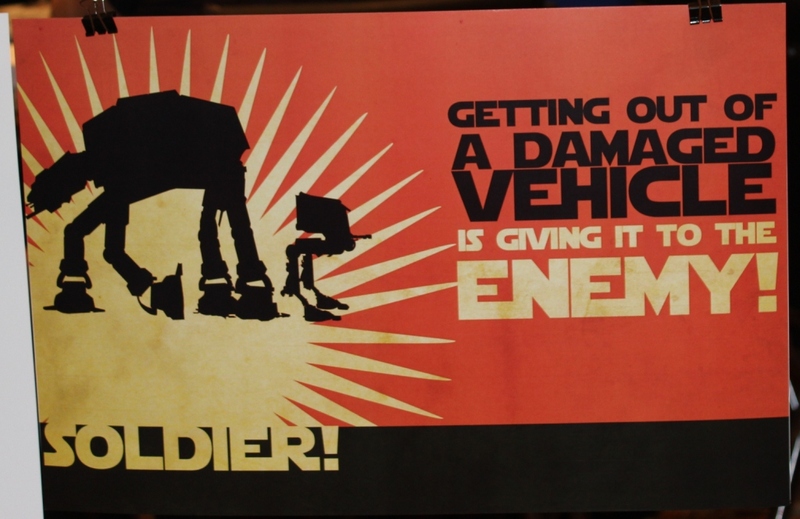 Although she also had an amusing sign about remaining in one’s damaged vehicle (see left). 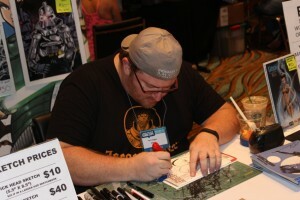 – Jerry Pesce had numerous pieces, mostly individual portraits, which were good. 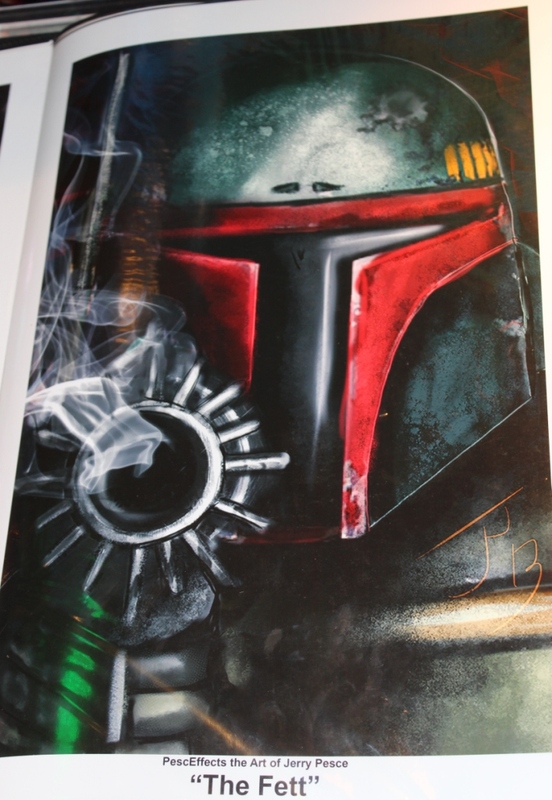 The one that caught my eye immediately was his “The Fett”, which is a close-up of Boba Fett immediately after having firing his gun, with the smoke still emerging from the barrel – it’s great. 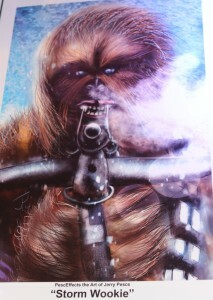 He also had a good “Storm Wookie” piece with a wookiee (probably Chewbacca) aiming his crossbow right at the viewer. In addition to his portraits, he also had one with Princess Leia choking Jabba the Hutt; in speaking with him about it, he told me that it’s actually quite difficult to draw her face. 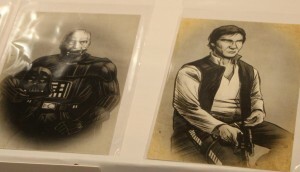 He pointed across the aisle at another artist who pictured the same scene, except replacing Leia with an altogether different-looking, sort of cartoonish character. 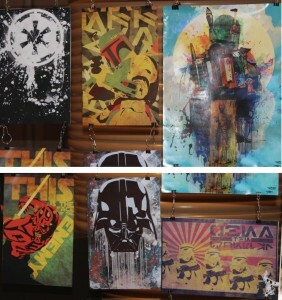 He said many artists just don’t even try. 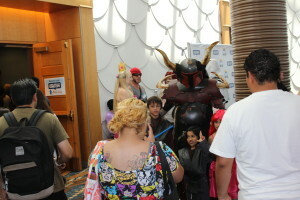 For instance, another image (see the bottom of my WonderCon post) just simply uses a different model and does not even try to replicate Carrie Fisher. – Livio Ramondelli had some interesting pieces showing not scenes that actually occurred, but scenes that could have been. 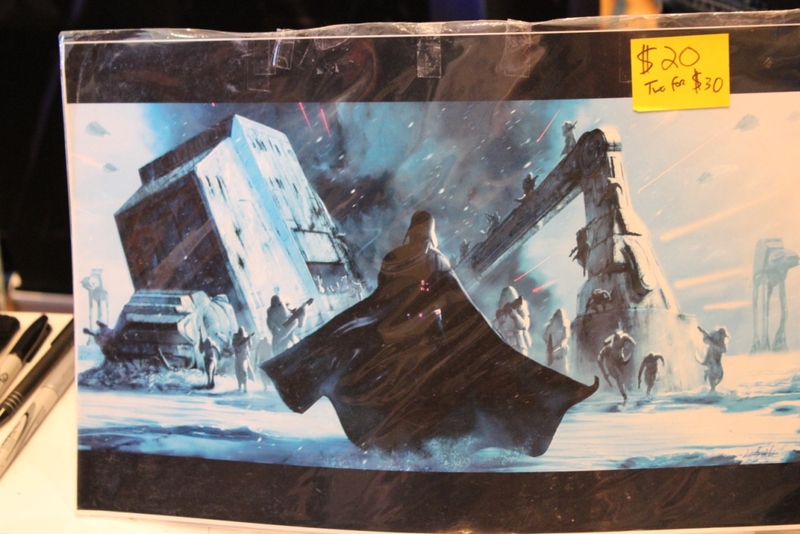 My two favorite pieces also happened to be on sale on metal (so they sort of looked like they were moving): a rendering of Darth Vader on Hoth (on right) and one of Boba Fett having emerged from the Sarlacc Pit (viewable here). These images gave off an iconic sense and were certainly enjoyable! 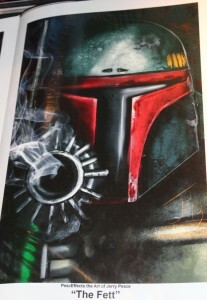 – Tom Hodges had a great amount of artwork and really fantastic stuff. While he did not permit me to take any pictures of his fantastic Star Wars art, I did learn that he had been the lead artist on Star Wars web comics! That was quite a very happy surprise 🙂 Hopefully, I will be able to ask him for further information about his work on official Star Wars material in the future (stay posted). – Lastly, I greatly appreciated the work of Albert Nguyen, who created Star Wars mash-ups with military photographs. 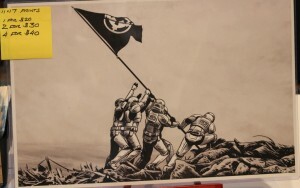 His two primary pieces were of stormtroopers raising the flag at Iwo Jima and Darth Vader crossing “the Delaware” (on Tattooine). 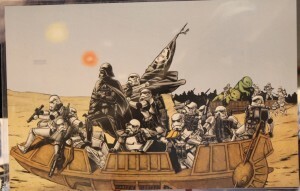 Nguyen said he chose to opt for these mash-ups, “because I love military history and I love Star Wars, so I stick them together.” It’s some great stuff!